Even an experienced speaker like Guy Kawasaki says, “Moderating a panel is deceptively hard--harder, in fact, than keynoting." This blog offers tips and examples on how to be a better panel discussion moderator, with advice from The Eloquent Woman's Guide to Moderating Panels and speaker coach Denise Graveline. Get ready to encounter this last-minute request if you're a panel moderator: "Can you act as a panelist as well as the moderator? Jane isn't going to be able to make it." It's that no-show panelist that most often prompts organizers to make this request, perhaps because they imagine the smaller panel won't be able to fill the time. They also may be prompted by your expertise in the topic at hand. And let's face it: The organizer is bound to be disappointed by the loss of what she hoped that panelist would contribute. But serving as a moderator-plus-panelist puts you as moderator into an awkward role, and you shouldn't be afraid to say so. Are you in charge of others' speaking times as well as your own? Yes, but don't expect that to be popular. Will the combination of your moderator speaking tasks and your panelist time make it feel as if you're talking too much? Also yes, most of the time. Be sure to ask enough questions ahead of time to determine whether you might be called upon to fill this role, so you can prepare. (That might look like, "In the event a panelist cancels, I would plan to be ready to moderate with fewer speakers. Do you agree?") Make sure, too, that you're giving the other panelists plenty of time. But primarily, my advice is to push back on the idea that another panelist is needed. If what you are left with is two panelists, treat it like a dual interview, and allow plenty of time for audience questions, something that's usually more welcome. Feel free to suggest that to the organizer ahead of time, and by the time the panelist begs off, it won't seem like such a strange idea. 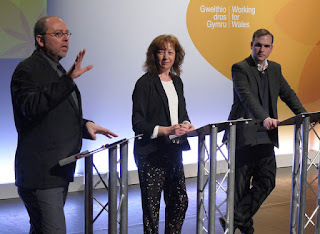 Need more coaching on how to be a better panel moderator? 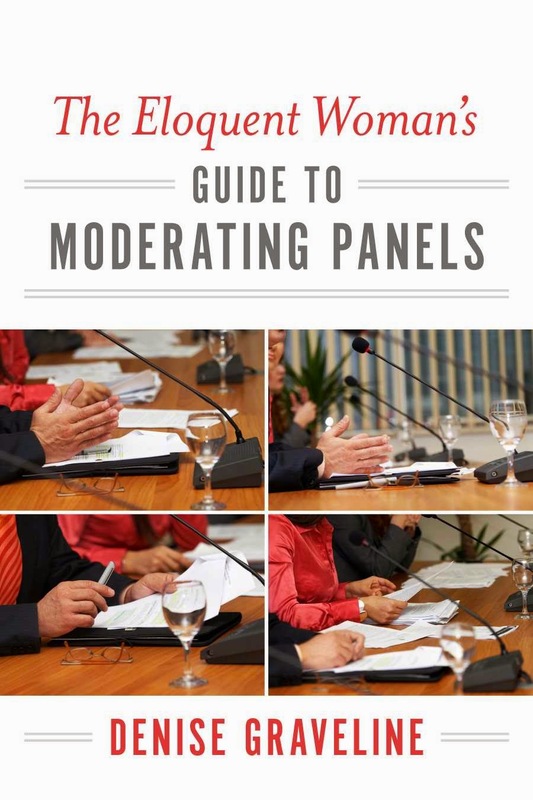 Order the new ebook The Eloquent Woman's Guide to Moderating Panels. At just $3.99 and available in many formats, it's a great back-pocket coach to take on stage with you in your smartphone or tablet. 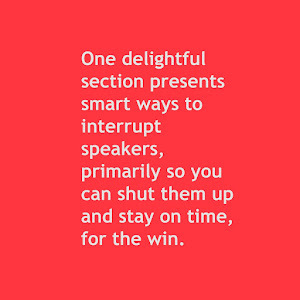 Find more tips on public speaking on The Eloquent Woman blog. Copyright 2017 by Denise Graveline. All rights reserved; reprints encouraged with permission. Simple theme. Powered by Blogger.